Yves Saint Laurent at the Petit Palais. The men's tuxedo jacket Laurent stole for the female wardrobe. Yves Saint Laurent killed himself in January of 2002. He died six years later. When you are as great as he was, you’ve earned the two deaths. The second death was bodily, cancer finally caught up with him. The first death was in the form of official retirement, the closing down of the Yves Saint Laurent name as it had existed for forty years. During that time, Laurent dominated fashion like no one else. It has been said that he created the modern woman. 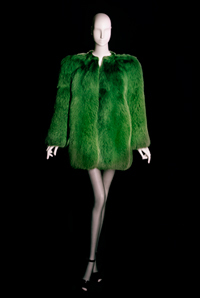 “Yves Saint Laurent Retrospective” Through August 29. Petit Palais, Paris. There is a retrospective at the Petit Palais in Paris running through the end August where you can walk through those forty years, from his debut “Trapèze” collection with Dior in 1958 to the final collection of evening dresses in 2002. One wall of the exhibit is completely covered with mannequins wearing every version of “le smoking,” the men’s tuxedo jacket that Laurent stole for the female wardrobe and re-imagined over the years. That smoking jacket changed women’s fashion forever. It is black, sultry and dangerous. A man’s smoking jacket made to look sleek and feminine, it says that women’s high fashion can have everything it wants, that all the old divisions are nothing. When Laurent killed off his name and ended his legacy in 2002, he was completing a process that he’d been engaged in all along. Even from that first Trapèze collection in 1958—which was inspired by the costumes trapeze performers used to wear—Laurent was breaking down the boundaries that defined haute couture (high dressmaking). He was actively completing a story of fashion begun in the previous century. And in completing it, he was slowly, over an entire life, laying it in its grave. 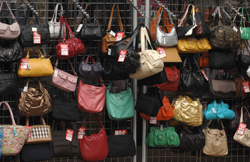 The story of haute couture is often thought to have begun with an Englishman. His name was Charles Frederick Worth and he began to make a reputation for himself in Paris toward the end of the 19th century. That reputation was based on one simple desire, which Worth was willing to fulfill. Rich women wanted beautiful dresses. They wanted them to be unique and they wanted them handmade. There is, thus, no such thing as haute couture without the stratified social milieu of 19th century Europe. There had to be, for the elite, lots of money, and lots of free time for fancy balls. That world, as we all know, was dealt something of a deathblow by the social transformations around the turn of the 20th century and then with the two world wars. The fabulous balls and evening events of the late 19th century were not flourishing amongst the smoking ruins of Europe in 1945. It’s all the more remarkable, then, that a Golden Age of haute couture emerged out of the wreckage of WWII. Christian Dior presented his “New Look” in 1947 and the great game of high fashion was off and running once more. In retrospect, we can see how the rebirth of haute couture came about. The devastation of the war years did the opposite of stamping out the need for fine things and frivolity. In the wake of bad times, people wanted their high fashion and they wanted it now. The trampoline-like nature of the human psyche was proven once again. The collective psychology bounced back from war to cocktail parties in record time. Dior was there to give the bounce real spring. His “Figure 8” of Spring 1947 was all about feminine grace and charm, cinched waist, pronounced shoulders and hips. Elegance had returned to the scene. Yves Saint Laurent grew up in that scenario, the miraculous postwar Golden Age of haute couture. He suspected from the very beginning that he was dressing up a corpse. The desire for fashion and beautiful things was real. The social foundations upon which to sustain a lasting haute couture were not real. The first fifty years of the 20th century had destroyed that foundation, really and truly. And so, Laurent decided to do two things. He decided to dance with the corpse for as long as possible, and he decided to prepare the foundation for the next trend. That meant giving women their haute couture and taking it away from them, too. Laurent proved to be a master, a genius of giving and taking away. Rarely has a human being been so utterly aware of their place in history, so temperamentally well suited to the task at hand. In the exhibit at the Petit Palais, the curators have recreated his studio at 5 avenue Marceau, with its simple desk in front of a push pin board where he would throw up quick sketches and ideas. I imagine Laurent at his desk day in and day out, shoring up the foundations of haute couture with one hand while he chips away at the edifice with the other. He was deciding how far to go, when to pull back, testing the limits of his project of annihilation and rebirth. The dialectic had already been established in that first collection for Dior. There is a playfulness to the outfits, a willingness to let fashion be touched by popular culture that goes beyond naming the collection Trapèze. I think especially of the bows. Laurent put bows and ribbons on the fronts of many of the dresses in that collection. It gives the whole line a little-girl frivolity that everyone could relate to. Sure it was haute couture, but it was primal, too. Laurent knew how to bring the child out in the lady. He was already letting some light in to the closed room of haute couture. But not too much light. He was also rebuilding, continuing the work that Dior had started in remaking a sense of high style after the debacle of world war. There’s a white dress from the Trapéze collection that does away with Dior’s snitched waste and frees the woman’s body. It is, in that, a step forward from Dior. The dress also has the delicacy of another age. A princess would wear it in order to float down an endless staircase. Laurent played that double game all through the 60s. His red, white and blue striped cocktail dress from 1966 is the perfect embodiment of this giving-and-taking-two-step. The dress is more or less a navy uniform, something you’d otherwise find at a thrift store or an Army Navy outlet. Only, he gave it feminine lines, and stuck sequins all over the thing. Laurent must have been laughing to himself all the way through its debut on the runway. Outrageous, funny, sweet, the damn dress somehow manages to look classy. It is, after all, a cocktail dress. And Laurent made it into something special, something that would mark you out, in wearing it, as having that extra spark of taste and style. The dress throws the doors of haute couture wide open and then slams those doors shut again by being so refined, so unattainable, so haute. Same thing with the burgundy wool jumpsuit from 1969. It is chic and hip simultaneously. There’s a beatnik flavor to the casual line, an edgy feminism to the whole idea of a jumpsuit as high fashion. And then you realize that only an aristocrat could wear it. The lines are so delicate, you’d have to have gone to finishing school to walk in the right way, to hold the pose just so. It takes and gives just like the Navy cocktail dress. Laurent widened the scope of what counts as haute couture, keeping the tradition alive with a careful infusion of new ideas and contemporary references. He would not let haute couture become solely the look of a dying class sequestered in its musty palaces. He gave pants and jackets to women. 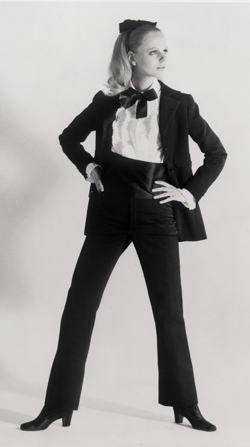 He incorporated the everyday look of 60s pop culture into his designs for haute couture. But in liberating haute couture he is also breaking down the divide between haute couture and regular fashion altogether. These tensions came to a head in Laurent’s collection from the summer of 1971. After all the contemporary references and futuristic hipness of the collections in the late 60s, Laurent went backwards. He played with the look of the immediate postwar period, a 40s look. He used crazy and unusual fabrics and materials (like camouflage), playing with the idea that you can make fashion from anything when the circumstances (like the shortages created by war) demand it. His bright green fox fur coat from that collection is something a prostitute would have worn in 1943 in order to pick up a German soldier during the Occupation. The critics hated the show. They said that Laurent had finally gone too far. They thought the clothing was ugly and inappropriate. But the collection was a success anyway. Laurent had rescued high fashion from the very predicament in which he’d placed it, that of ease and comfort and contemporaneousness. He was still playing his game, buttressing the corpse of haute couture with one move, further plunging it into the abyss with the next. Over the next two decades he would navigate that territory again and again. He widened the boundaries of haute couture in the 70s and 80s by taking bold colors from North Africa or incorporating a kimono look from Japan. Then he would pull back and emphasize the refinement of haute couture by designing clothing directly inspired by High Modernist artists like Mondrian and Cocteau.